Energy cooperation among member states of the GCC states could pave the way for further integration to increase economic efficiency, harmonise policies, improve governance and ensure security of supply. The region is facing a rapid increase in domestic energy demand as economic growth, coupled with large infrastructure and industrial projects, as well as population growth and immigration (total population jumped from 23 million in 1990 to 53 million in 2015), drive up electricity and fuel consumption. Additionally, such cooperation would create an even stronger regional bloc in the global oil market (that currently exists, to some extent, through OPEC). The GCC economies grew significantly over the past few decades, with a combined GDP of $1.6 trillion in 2014 and total exports of around $861 billion. Of course, oil price decline of the past two years have significantly reduced these figures. Collectively, the region makes up the world’s largest energy exporting bloc, holding 29.3% of the world’s total oil reserves and around 23% of its natural gas reserves. In fact, GCC countries depend heavily on the hydrocarbon sector. Before the price collapse, the sector accounted for 80% of its exports and fiscal revenues. 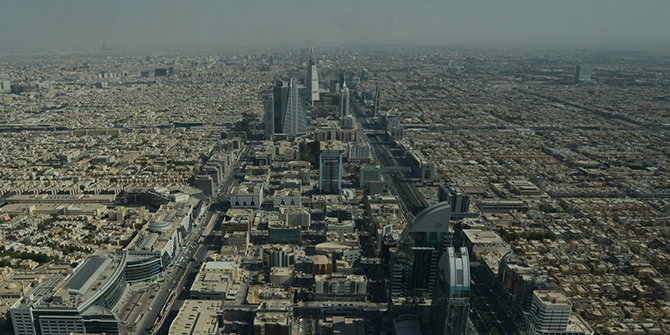 On a country basis, Saudi Arabia’s petroleum resources account for 50% of its GDP and 85% of the government revenues. Similarly, oil represents nearly half of the GDP in Kuwait and 93% of the government revenues. Collectively, the members of the GCC have so far achieved substantial milestones, such as establishing a regional free trade zone and a customs union. However, the cooperation has not yet realised its full potential. The GCC Interconnection Grid represents the bloc’s most successful energy cooperation project to date. Proposed based on a study making the case for establishing electricity trading through an integrated grid, GCC member states initially hesitated to move forward. However, several subsequent blackouts in the region during peak seasons accelerated its development. These reflected the reality that rapidly increasing domestic demand over the past decades has outstripped national infrastructures. The grid has been operating for emergency response since 2011, averting more than 1,400 incidents of power failure. In the summer of 2016, the GCC Interconnection Authority (GCCIA) used the grid to trade 132,000 MWh of power among the five member states, valued at $192 million. To date, no further effort has been made to optimise the economic benefits by further developing the grid and establishing a fully functioning regional electricity market. Studies show that electricity trading via the GCC grid is economically viable and could save member states around $5 billion in electricity sector investments and $1.8 billion in fossil fuel costs. Additionally, opportunities exist for cooperation in the gas sector, facilitating both use and trade of substantial resources in the region. All member states – with the exception of Qatar – suffer from a shortage of natural gas. Oman and the UAE are particularly affected, and have begun importing gas from Qatar through the Dolphin pipeline, as well as liquefied natural gas (LNG) from outside the region. This suggests it would be beneficial to develop a GCC-wide gas pipeline and a regional gas market. Areas for further energy cooperation include renewable and clean energy resources, nuclear energy projects. Plans are also being developed for a water connection project, which would have strong links to the power sector. Current conditions may be ripe to motivate policymakers to consider more substantive efforts toward regional energy integration. The slowdown of the GCC economy due to the global fall in oil prices has created a heavy burden on governments, prompting them to rethink energy prices, which currently costs more than $160 billion annually in potential revenues foregone. Domestic pressure to increase economic diversification, coupled with international pressure post-COP21 to reduce carbon dioxide emissions and mitigate climate change, present more incentives to cooperate. Low energy prices lead to the region exhibiting some of the highest per-capita emissions in the world, with Qatar ranking first. Their geographical proximity should motivate the six states to optimise natural resources, as well as financial and human capital, in relation to their respective industries. In parallel, diplomacy can play a role in greater integration to bring Gulf countries together in support of mutually beneficial goals. However, despite the projected benefits that could be achieved through cooperation, several barriers still hinder the efforts to boost cooperation. Political will is a key challenge; if that is established, implementation will follow more easily. At present, energy policies and regulations in the region are vague and unstable. Practically, each state has variable roles for independent regulatory bodies, and a different market structure to meet security of supply. Oman, for example, has a more advanced system, with a structured regulatory framework. Overall, the absence of a clear market structure for each state produces obstacles to a regional trade, in turn increasing the risks for potential investors. Additionally, energy prices are regulated at below international norms in all member states, with the intent of benefiting the local populations, but at different rates. Thus, countries may not wish to sell surplus oil and gas at these “subsidised” prices to other states, benefiting “foreigners”. To initiate a trade, GCC states would need to reconcile their pricing systems and resolve energy pricing in a transparent way to allow energy to cross borders, but retain welfare support at the domestic level. Energy is essential in order to support and maintain economic development at the national level. Countries must ensure their own interests and responsibilities are protected in the course of efforts to pursue joint projects. However, cooperation does imply relinquishing some control in order to share resources and infrastructure. To increase collaboration and interdependence, it is first necessary to build more trust. Imtenan Al-Mubarak is Senior Research Analyst at the King Abdullah Petroleum Studies and Research Center (KAPSARC), focusing on energy and economic policy research. She holds a Master’s degree from DePaul University, Chicago. She tweets at @Imtenan_Mubarak.